This year we are offering hive components priced individually. These are available for pick-up or shipped; please call or email for prices and shipping charges. Let us know the size of your available space, and we will build a beautiful finished wood hive with glass windows to fit with venting to outside. Maintenance contracts available, or do-it-yourself (we can provide instruction!). To see examples of our beautiful beehive displays in Knoxville, you can visit the New Ijams Nature Center; the Children’s Discovery Center in Chilhowee Park. 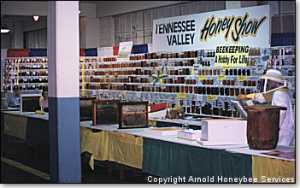 Also you can see our observation hives every fall as part of the Honey Show at the Tennessee Valley Fair. We also provide custom observation hives for two Knox County Schools - Green Academy and Gap Creek School. 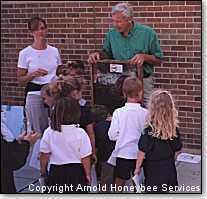 And speaking of schools, Arnold Honeybee Services can come to yours...from preschool to high school to home school, our honeybee presentation is a great way to bring nature to your classroom. Our presentation includes materials, an observation hive with bees and a marked queen, apiary equipment, a bee suit and hat to try on, pieces of beeswax for everyone to take home, and even a taste of honey for every student! Not only do your students learn the science of the beehive, they learn the role of bees in our ecosystem and why it is so crucial to preserve this partnership.